The embedded PDF below does not properly display the beauty of the cover, but you can still get a sense of the awesome content of the book. Happy Reading! Our last Daily Dinosaur is Hypacrosaurus (or Lambeosaurus) magnicristatus, whose first name (Hypacrosaurus) means “near the highest lizard,” because it was almost – but not quite – as large as the Tyrannosaurus. He seems much friendlier, too. Scroll down to see a headshot of this dinosaur, along with a colorful illustration of other members of the Lambeosaurus family, and some information about Hypacrosaurus magnicristatus. Be sure to check out the other Daily Dinosaurs, and look out for Gregory S. Paul’s Princeton Field Guide to Dinosaurs! This image is taken from The Princeton Field Guide to Dinosaurs by Gregory S. Paul. It may not be reproduced elsewhere without permission. FOSSIL REMAINS A few skulls, part of skeleton. ANATOMICAL CHARACTERISTICS Extremely large, oblong crest atop back of head. AGE Late Cretaceous, Late Campanian. DISTRIBUTION AND FORMATION Alberta; uppermost Dinosaur Park. HABITAT Well-watered, forested floodplain with coastal swamps and marshes, cool winters. NOTES May be the direct descendent of H. lambei. We seem to be on a roll with the armor-plated, spiny dinosaurs! Today’s Daily Dinosaur, Edmontonia rugosidens, is just as tough as the other two we have posted, and may have used its massive shoulder spikes to charge at enemies and defend itself. Read more below, or click here to see the other Daily Dinosaurs. FOSSIL REMAINS Several complete skulls and majority of skeletons. ANATOMICAL CHARACTERISTICS Belly and hip extremely broad. Armor plate covered cheeks, large, forward-directed spikes on flank of neck and shoulder, one spine partly split, no spines on main trunk or hips. AGE Late Cretaceous, Middle and/or Late Campanian. DISTRIBUTION AND FORMATION Montana, Alberta? ; Upper Two Medicine, possibly middle Dinosaur Park, Judith River. HABITAT Well-watered, forested floodplain with coastal swamps and marshes and drier upland woodlands. HABITS May have charged at opponents within species and tyrannosaurids with shoulder spikes, also hunkered down on the belly and used armor to avoid being wounded while using the great breadth of the body to prevent being overturned. NOTES It is not certain whether this species is known outside the Two Medicine Formation. While perhaps not as well-known as yesterday’s Stegosaurus stenops, this spiny fellow also boasts impressive plated armor, making it tough for any sharp-toothed predator to take a bite! Gregory Paul again provides three illustrations of the skeleton and outer surface, helping us get to know Gastonia burgei. Scroll down to learn more, or click here to read about the other Daily Dinosaurs. FOSSIL REMAINS A few skulls and skeletons from nearly complete to partial. ANATOMICAL CHARACTERISTICS Head very small, heavily armored, no teeth on front of upper jaw. Arm and leg very short. Belly extremely broad. Large sidewaysprojecting shoulder spines, no lateral spines at hip, modest spines on side of tail. DISTRIBUTION AND FORMATION Utah; Lower Cedar Mountain. HABITAT Short wet season, otherwise semiarid with floodplain prairies, open woodlands, and riverine forests. You’ll probably recognize today’s iconic Daily Dinosaur, the Stegosaurus stenops, by its large armored plates – they’re hard to miss! In The Princeton Field Guide to Dinosaurs, Gregory S. Paul helps us get to know this dinosaur inside and out with three detailed drawings of its skin and bone structure. Scroll down to read more about Stegosaurus below, or click here to see more Daily Dinosaurs! FOSSIL REMAINS Two complete skulls and several skeletons, completely known. ANATOMICAL CHARACTERISTICS Head shallow. Trunk short and deep, belly and hips narrow and slab sided. Leg long. Alternating armor plates very large over trunk and tail, two pairs of spines form subhorizontal pin-cushion array at end of S-curved tail tip. AGE Late Jurassic, Late Oxfordian to Middle Kimmeridgian. DISTRIBUTION AND FORMATION Colorado; lower Morrison. HABITAT Short wet season, otherwise semiarid with open floodplain prairies and riverine forests. HABITS Very well adapted for rearing, may have been able to walk slowly bipedally. Broken and healed spines and wound in Allosaurus tail show it used tail spine array as a weapon. NOTES Because the original Stegosaurus specimen is incomplete and poorly documented, the basis of the genus and the various species is poorly understood. Main enemy Allosaurus. Today’s Daily Dinosaur, brought to you by Gregory S. Paul’s The Princeton Field Guide to Dinosaurs, gives us a look under the skin of Datousaurus bashenesis. Datousaurus means either “chieftain lizard” or “big-head lizard” (from the Malay datou, or “chieftain”; or the Chinese, da tou, “big head”; and Greek sauros/σαυρος “lizard”). Read more about this dinosaur below, or check out the other Daily Dinosaurs here. FOSSIL REMAINS Partial skull and skeletons. ANATOMICAL CHARACTERISTICS Neck moderately long. A little shoulder high. AGE Late Jurassic, Bathonian and/or Callovian. DISTRIBUTION AND FORMATION Central China; Xiashaximiao. NOTES Shared its habitat with Shunosaurus and Omeisaurus. It’s easier to believe that dinosaurs are birds’ ancestors when you see the ostrich-like Struthiomimus edmontonicus. This guy is bigger than any bird you’ve seen, though; he stands 12 feet tall and weighs almost 400 pounds! Scroll down to read more about Struthiomimus, and be sure to check out the other Daily Dinosaurs. FOSSIL REMAINS Several complete skulls and skeletons. ANATOMICAL CHARACTERISTICS Skull gracile. Fingers nearly equal in length, claws long, nearly straight, and delicate. Legs very long. AGE Late Cretaceous, Early Maastrichtian. DISTRIBUTION AND FORMATION Alberta; lower Horseshoe Canyon. NOTES Probably includes Dromicieomimus brevitertius. May be the descendent of S. altus. Main enemy juvenile Albertosaurus sarcophagus. Today, Daily Dinosaur presents the tyrannosaurids, the most advanced and sophisticated of the large theropods. Also probably the most memorable – one well-known member of this group is the Tyrannosaurus, who made his unforgettable (and frightening!) appearance in the Jurassic Park films. Read on about tyrannosaurids below, and check out the other Daily Dinosaurs here. Large to gigantic tyrannosauroids, limited to the later Late Cretaceous of North America and Asia. ANATOMICAL CHARACTERISTICS Highly uniform… Eyes face partly forward, and some degree of stereo vision possible… Reduction of tail and arms in favor of enlarged and elongated leg indicates greater speed potential than in other giant theropods… Brains larger than usual in large theropods, olfactory bulbs especially large. ONTOGENY Growth rates moderately rapid, adult size reached in about two decades, life span normally does not exceed three decades. HABITS Long snouts of juveniles suggest they were independent hunters… Giant adults [used] their massive heads and strong teeth to dispatch victims with powerful, deep punch-like rather than slashing wounding bites aimed with forward vision, powered by very strong jaw and neck muscles, and intended to cripple prey before it could be safely consumed. Function of arms poorly understood: they appear too short and small to be useful handling prey; may have provided grip for males while mating. Head bosses presumably for head butting during intraspecific contests. NOTES Overall the most advanced and sophisticated of large theropods. 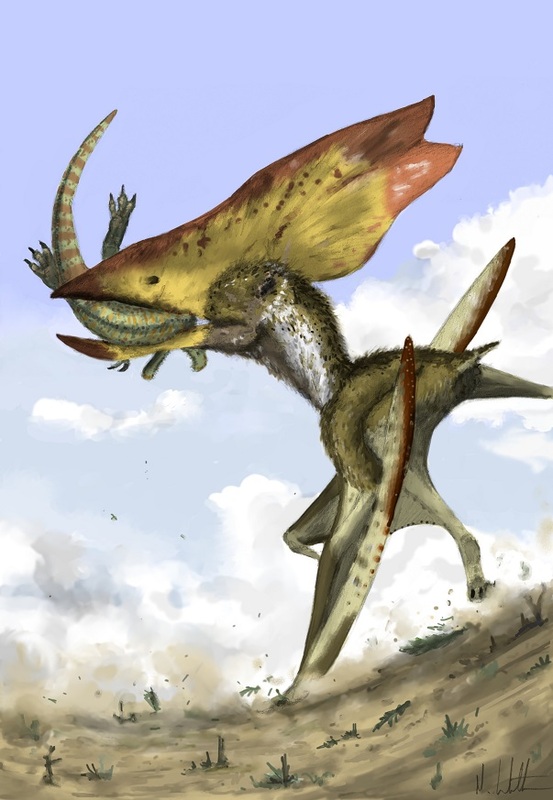 Large numbers of hunting juveniles may have swamped their habitats, suppressing the populations of smaller theropods such as dromaeosaurids and troodontids. Here’s another two-fer: a look at the outer appearance and the internal skeleton of the Raptorex kriegstenis, from Gregory S. Paul’s The Princeton Field Guide to Dinosaurs. The detailed illustrations allow us to see the dinosaur’s long legs and well-developed leg muscles, perfect for pursuing and ambushing prey at high speeds. Scroll down to read more about Raptorex or click here to see more Daily Dinosaurs! FOSSIL REMAINS Majority of skull and skeleton. ANATOMICAL CHARACTERISTICS Standard for derived tyrannosaurs. AGE Early Cretaceous, probably Barremian. DISTRIBUTION AND FORMATION Northeast China-Mongolia border; probably lower Yixian. evolved by the late Early Cretaceous, that the emphasis of the head as the killing weapon to the exclusion of the arms in gracile forms was retained by the juveniles of later, larger species, and the presence of small arms in an agile predator shows that arm reduction is not evidence of scavenging in larger tyrannosaurs. The Yangchuanosaurus dongi, believed to be a species of Sinraptor, is a fierce member of the Carnosaurs, the large predatory avetheropods that roamed most continents from the Middle Jurassic to the end of the Dinosaur Era. With its jagged teeth and powerful neck muscles, Yangchuanosaurus dongi was able to cripple prey with slashing bites. Scroll down to learn more about this dinosaur, and check out the other Daily Dinosaurs here. FOSSIL REMAINS Complete skulls and majority of a skeleton. ANATOMICAL CHARACTERISTICS Snout ridges not well developed. AGE Late Jurassic, probably Oxfordian. DISTRIBUTION AND FORMATION Northwest China; Shishugou. HABITAT Prey included mamenchisaur sauropods. NOTES This species barely differs from Y. shangyuensis. Today’s Daily Dinosaur, taken from the introduction of Gregory S. Paul’s The Princeton Field Guide to Dinosaurs, showcases the skeletons of several gigantic dinosaurs and compares them to the skeletons of mammals. The human in the center is dwarfed by these gargantuan beasts! Scroll down for a brief excerpt about dinosaur gigantism from the book, and check out the other Daily Dinosaurs here! Although dinosaurs evolved from small protodinosaurs, and many were small—birds included—dinosaurs are famous for their tendency to develop gigantic forms. The average mammal is the size of a dog, whereas the average dinosaur was bear-sized. But those are just averages. Predatory theropods reached as much as 10 tonnes, as big as elephants and dwarfing the largest carnivorous mammals by a factor or ten or more. Sauropods exceeded the size of the largest land mammals, mammoths, and the long-legged indricothere rhinos of 15 to 20 tonnes, by a factor of at least five.